The Trump administration's budget would cut a combined $452 million for research grants, flood mapping and analysis. OCEAN CITY, N.J. – Marty Mozzo gets a gorgeous show each night when the sun sets over wetlands near his property on the bay side of a barrier island. 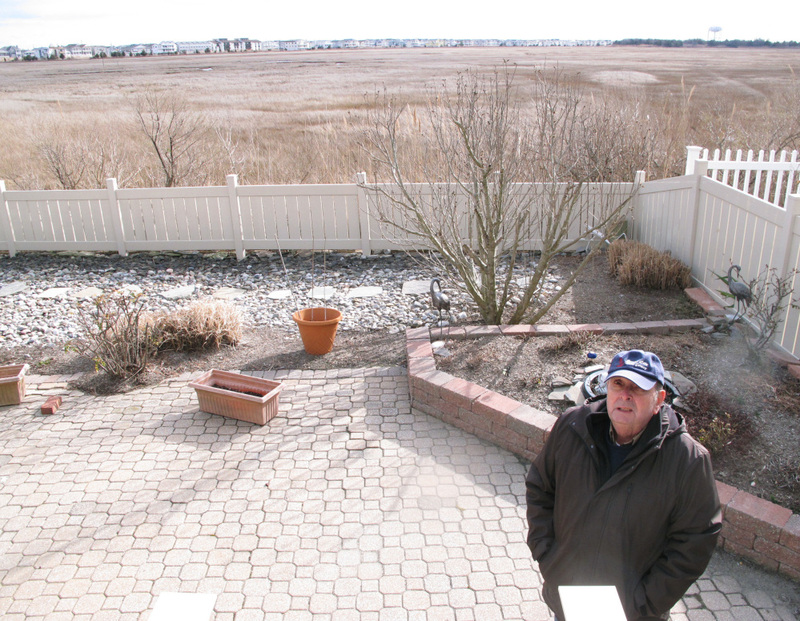 Marty Mozzo stands in his backyard in Ocean City, N.J., on the edge of a back-bay wetland, in February. 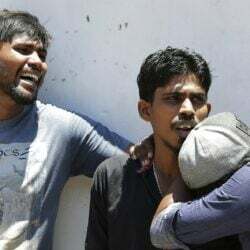 When he and his wife were considering buying the house, they looked at a small trickle of water in the distance and wondered if the property would flood, deciding the water was too far away to pose a danger. Within weeks, their house was surrounded by floodwaters. Within weeks of moving in, a storm stranded them for two days with water on all sides. Theirs is one of several neighborhoods in Ocean City, New Jersey, where residents have adopted unofficial flood etiquette: Don’t drive too fast through flooded streets or you’ll create wakes that slam into houses, scatter garbage cans, and damage lawns and gardens. They are among millions of people worldwide whose lives and land are being dampened by back-bay flooding – inundation of waterfront areas behind barrier islands where wind and tides can create flooding during storms or even on sunny days. It’s a type of flooding that tends to be overshadowed by oceanfront storm damage that grabs headlines – and government spending – with dramatic video of crashing waves and splintered houses. 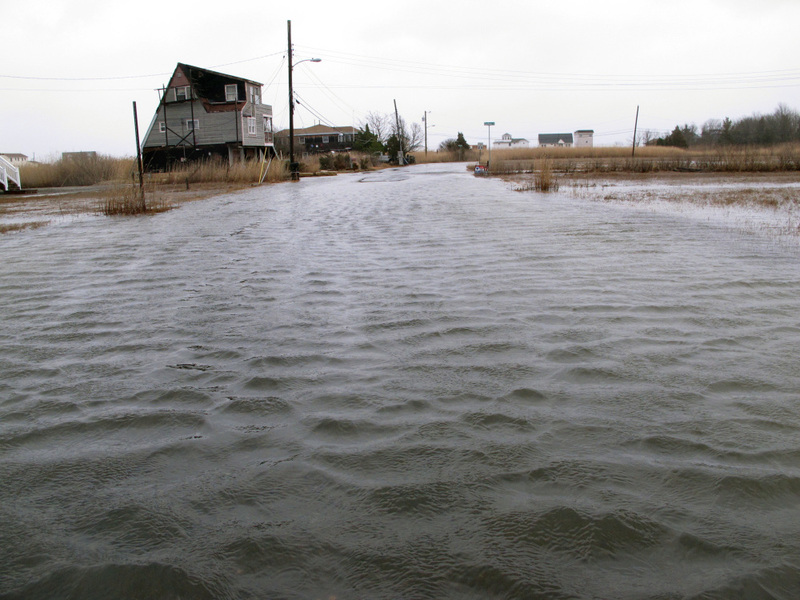 The streets are flooded in a back-bay neighborhood in Manahawkin, N.J., after a moderate storm in March. Scientists and people living in back-bay areas behind barrier islands say flooding is increasing, even as the problem gets less attention and money than flooding along the ocean. Nearly five years after Superstorm Sandy delivered a wake-up call, the problem of back-bay flooding is coming into sharper focus. Studies are underway, money is starting to flow toward the problem, and the realization that destruction of wetlands for development along such shores is partly to blame is leading to discussion about building codes. Sandy created a vast swath of destruction along the coasts of New Jersey and New York in 2012. But it also wreaked havoc along the back bays, where miles of lagoons exposed thousands of waterfront homes to flooding damage. Property owners in Toms River, New Jersey, received more than $568 million in payments from the Federal Emergency Management Agency after Sandy. Neighboring Brick Township received more than $267 million. Both towns have limited oceanfront exposure but extensive back bay exposure, and they represented the largest damage totals in Ocean County, the region of New Jersey that took the hardest hit from Sandy. 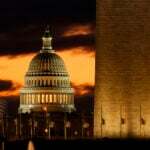 President Trump’s budget proposal, released last week, would cut a combined $452 million from the National Oceanographic and Atmospheric Administration and the Homeland Security department for research grants, flood mapping and analysis. If enacted by Congress, many environmental groups worry, less money will be available to study back-bay flooding. Jeff Gebert, chief of coastal planning for U.S. Army Corps of Engineers Philadelphia division, acknowledged that before Sandy, back bay flooding was not as high on the agency’s radar, due in part to the lack of easy engineering solutions. As of January, the Army Corps map of recent storm protection and navigation projects in New Jersey showed 10 either completed or underway, with six more planned. But none were done in back bays. The picture is largely the same nationwide, he said, “because the solution to back bay flooding is much more complicated” than simply pumping sand onto oceanfront beaches. A 2010 study by the National Oceanic and Atmospheric Administration found that more than 123 million people – or about 39 percent of the U.S. population – lived in coastal zone counties, a number projected to grow by 8 percent by 2020. The greater proportion of those people live on or near the bay sides of barrier islands, scientists say, than on the oceanfront. Unlike oceanfront flooding, where crashing waves from storm-driven seas pound the beaches, back bays flood gradually and comparatively quietly as water levels rise. The effect is worsened during storms that continue through numerous tide cycles in which water piles up in the back bays without being able to drain out to sea. 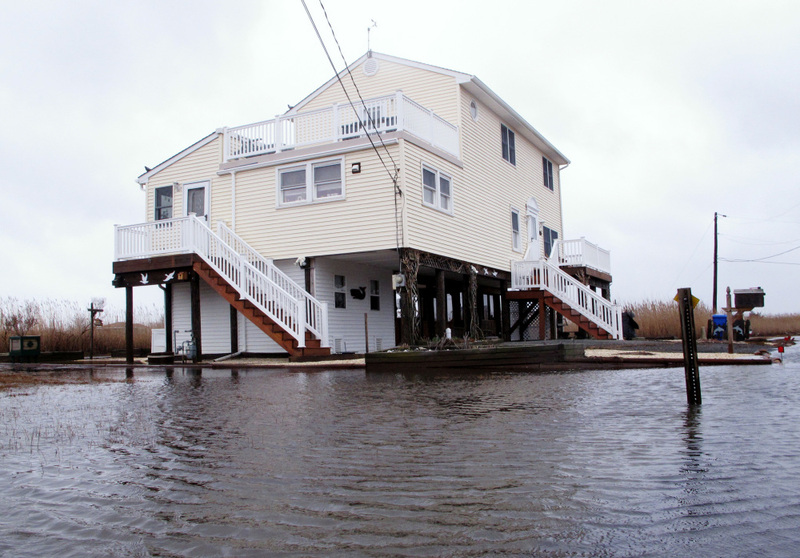 Jim and Maryann O’Neill’s home in a back-bay neighborhood of Manahawkin N.J., is surrounded by water after a moderate storm in March. New Jersey has funded some smaller resiliency projects in areas including back bays, but none was designed specifically for flood control. It hopes the study underway will identify a range of possible solutions. The Army Corps and state officials began a three-year study of back bay flooding in December in New Jersey that seeks cost-effective solutions that can be replicated elsewhere. Similar studies are underway or were recently completed in New York, Virginia, Texas, Connecticut, Rhode Island, Maryland and Washington, D.C. Many traditional engineering solutions that are used along the oceanfront are of limited benefit against back-bay flooding. Houses are being elevated and roadways repaved to make them higher. But the bulkheads, sea walls and sand dunes used along the ocean can’t be replicated in many back-bay areas because of limited space and resistance from homeowners who prize waterfront views. Any new homes need to be built in these areas with sea level rise in mind, said Princeton geosciences professor Michael Oppenheimer. Globally, sea levels have been rising over the past century, NOAA says, and the rate has increased in recent decades. 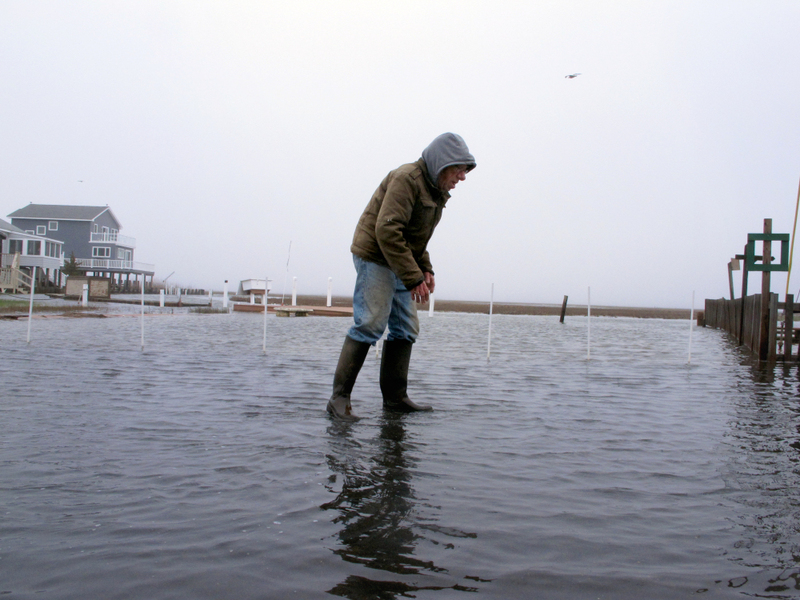 In New Jersey, seas have risen by 1.3 feet over the past 100 years, said Benjamin Horton, a Rutgers University professor and leading expert on climate change and sea level rise. That is a faster pace than for the past 2,000 years combined, he said. Jim and Maryann O’Neill moved from Philadelphia to a section of Stafford Township, New Jersey, in 1994 for a quiet existence near the water. But they’re now much nearer to it than they bargained for. In January 2016, a coastal storm inundated the O’Neills’ neighborhood; a March 2017 storm submerged the roads and deposited fish on the pavement in front of their house. And that was two years after the town raised the road by their house by 8 inches. They’ve had to build a boardwalk from their back stairs to the edge of their property because the yard has been underwater or muddy – “like quicksand,” said Jim O’Neill – virtually every day for the past five years. Maryann, 75, recently learned how to use an app that notifies her when the tides are rising. The O’Neills routinely have to move their car to the highest spot around – the bridge leading to their neighborhood. They have already rusted through three pickup trucks and three cars in the past 13 years. In Ocean City, officials will spend $40.3 million over the next five years on drainage improvements and road work that includes elevating roadways, new pipes and pumping stations. Such work in his neighborhood has cut down on flooding, Mozzo acknowledged.